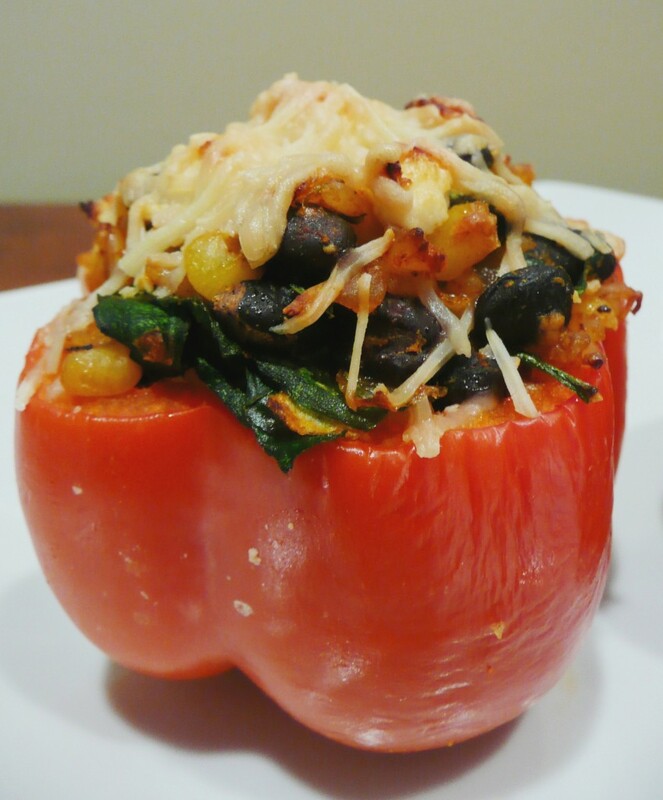 Stuffed peppers are so simple to make, but when you serve them everyone is like “oooo!”. It’s great to make ahead and then stick in the oven when you’re ready to cook! The leftovers make a great lunch and you really won’t be disappointed with this recipe. The red pepper makes it slightly sweet, so I add the cayenne to heat up the insides…the balance makes a great flavor combo that isn’t spicy at all! 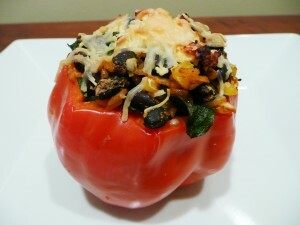 The black beans provide your protein, the veggies an insane amount of flavor. It’s a filling dinner that won’t weight you down. In a skillet over low heat, cook the onion and garlic with around 2 tablespoons of oil. Sprinkle with salt. Cover for around 10 minutes. Add in the pasta sauce. Stir so everything is combined. Add the seasonings and a pinch of ground black pepper. Add the cooked rice, stir to combine. Cook for 2 minutes (or until warmed through). Rinse and drain the black beans. Stir the drained black beans into skillet. Sprinkle with salt. Allow it to heat through (around 2 minutes), and then add the frozen corn, spinach, and 2 tablespoons of shredded parmesan cheese. Stir to combine everything. Turn heat off. Wash and then cut the tops off the bell peppers. Remove the inside of the pepper (the membrane and seeds). You now have a pepper “cup” that will hold the filling you just made. Take the filling and stuff one pepper at a time. There should be no filling left over. Stand the peppers up in the skillet that you just cooked the filling in. 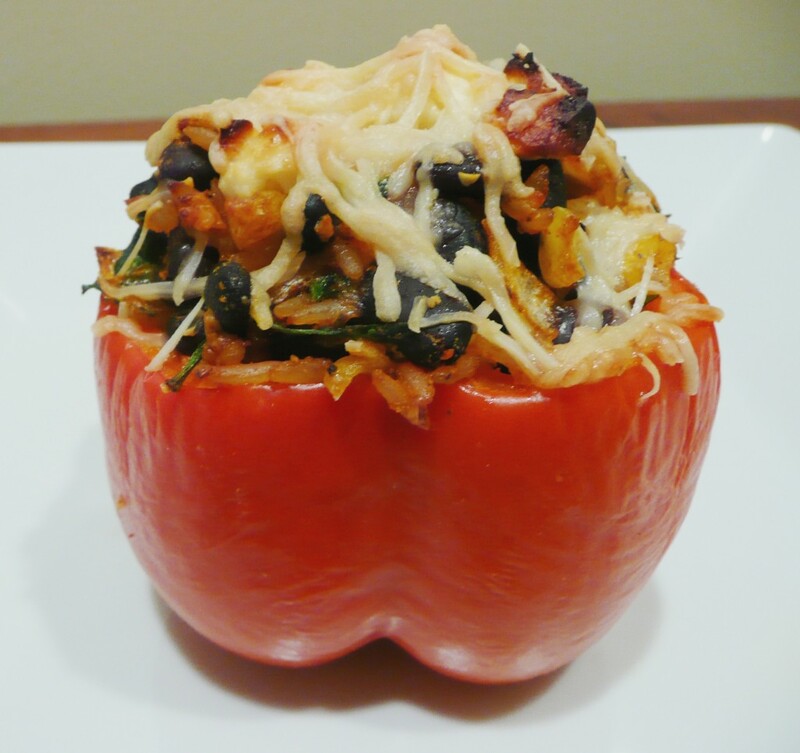 Top each pepper with 1 tablespoon of parmesan cheese and 1 teaspoon of feta cheese. Put the skillet into the oven, preheated at 375 degrees Fahrenheit. Cook for 40-45 minutes (the cheese will begin to brown and pepper skin will wrinkle a bit).